Police in Wodonga, Victoria, Australia, are working on a case they are hoping to get to the bottom of. 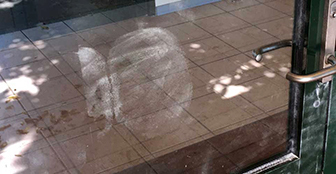 Officers were baffled by a particularly unusual print detected on a glass door, after a break-in at the local community hall. While the scene was being dusted for prints, a shape from a pantless bare bottom began to appear. It is still not known exactly why the offender left the unexpected mark behind. "They're having a joke, or they're actually trying to lean up against the door to break in, but I don't know why they'd do it pantless," crime scene sergeant Shane Martin said.